Mussoorie is the municipal board of Dehradun Region and well-known city of northern state of Uttarakhand. 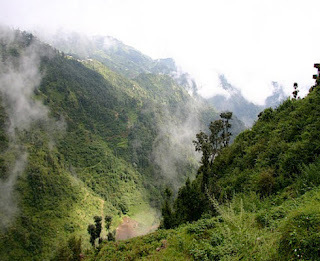 This amazing hill station is situated at 35 km distant from the capital Dehradun. The distance between New Delhi and Mussoorie is around 290 km. This foothill station of Garhwal Himalayan ranges is properly identified as Queen of Hills. Mussoorie is the fully covered greenery hill station with loads of flora and fauna. The altitude of this mount station is 1,880 metres. As per experts, this place is containing fairyland atmosphere and should be the first choice for tourists. There are lots of peak spots in Mussoorie, but Lal Tibba is highest with great height of 2,290 metres above. Reaching Mussoorie is possible through road and the nearest destination for this hill station is Saharanpur, which is just 58 miles away. However, nearest railway station for Mussoorie is Dehradun. There are countless spots to visit, but the main area where visitors can enjoy being the Mall. This place is stretched from the public library to picture palace. Mussoorie is having big value, and many famous personalities are regularly visiting this hill station frequently. Motilal Nehru the father of former PM Jawaharlal Nehru and Indira Gandhi the daughters of Jawaharlal Nehru were the regular visitors of Mussoorie, and they use to stay in Savoy Hotel. Today ample of hotels and lodges are opened in Mussoorie, which is turned as the suffering reason of over-development. This hill station is the finest place for summer vacation, and people are coming to Mussoorie through the world, particularly in summers. The finest period to reach Mussoorie is between March to November. Mussoorie is the world-known place for the educational Institute as there are many schools and colleges with boarding facilities where lots of students are getting educated. St George’s College is one of them, and its establishment period is 1853. It is the oldest and reputed schools of India. This school is spread in 400 acres, and it is recognized as Manor House. Today, this college is turned as the main architectural attraction of Mussoorie. Wynberg Allen School: This is another top school of the country established in 1888. This school is having two branches. One is the junior branch which is known as Wynberg and other is a senior branch, which is identified as Allen. The next school is GNFCS (Guru Nanak Fifth Centenary School). This school is on the top in the list of best boarding schools of India. Mussoorie has stunning greenery around the hills. The wonderful roads and beautiful garden of remembrance are spots where visitors can enjoy for long time. Gun Hill: This is the second top most point of Mussoorie providing dazzling view hills surrounding this hill station. To reach the Gun Hill visitors can use the cable car available on Mall road. Users can enjoy the Kempty falls in Gun hill. Company Garden: this is another popular tourist destination, which becomes amazing in season. The garden gets fully covered with flowers and plants. The first Tibetan temple of India is also situated in Mussoorie, though it was made by the Tibetan refugees in 1960. Lal Tibba: the next spot available for visitors is Lal Tibba. This place is known as the largest roller skating place in India. Lake Mist: This is the lake situated at 5 km distance from Kempty falls. This is a good picnic spot with ample of lodges and restaurant. Visitors can enjoy the boating in Lake Mist. Ivy Bank Guest House: this pretty guest house is small in size, but the amazing looks and beautiful construction make it different than other guest houses. The white window panes and comfort at low charges are special of this guest house. Municipal Garden: this picnic spot is having a striking garden and non-natural mini lake with boating feature. Visitors can reach this garden by rickshaw cycles. The private car services are also available as private transport to reach the garden. Mussoorie Lake: This is the lake built by City Board & MDDA (Mussoorie Dehradun Development Authority). It is situated at 6 km distance from main city of Mussoorie. The enchanting view of Doon Valley is possible from this point. People should not forget the night view from this lake, which is another special thing in Mussoorie. Childer’s Lodge: this is another highest peak of Mussoorie situated near Lal Tibba. The horse riding at this lodge could be different experience. The view of snow and astonishing hills from this spot is also special. Bhatta Falls: nature lovers can enjoy Bhatt Falls situated at 7 km distance from the city. This fall is easily reachable through road as it is situated on Mussoorie-Dehradun Road. Bathing and amusement events at this spot are available for visitors. Jharipani Fall: one more water fall is available for a tourist. This is 8.5 km distant from the city, and tourist can reach the spot through local transport. Mossy fall: This is a water fall covered with dense forest, and the distance between city and spot is around 7 km. Sir George Everest’s House: this estate is a good example of best architecture in Mussoorie. This spot is also the nearest point to Gandhi Chowk where a visitor can enjoy Library Bazaar. Reaching there is possible through different vehicles and private transports. The enchanting view of Doon Valley is again special thing from this spot. Aglar River valley and wonderful snow peaks from the spot could be diverse experience of life. Nag Devta Temple: this is the ancient temple where Snake God Lord Shiva is devoted. It is located on Cart Mackenzie Road, which is only 6 km away from Mussoorie. This temple is situated on the road of Mussoorie-Dehradun. Jwalaji Temple at Benog Hill: the next temple in the tourist spot is Jwalaji Temple. The average altitude of this temple is 2240 meters and the distance of the temple from the city is 9 kms. Jwalaji temple is constructed on Benog Tibba Hill where visitors can enjoy the view of nature beauty. The old idol of Goddess Durga is also special at this spot. Cloud End: The best services and excellent constructed hotel of Mussoorie is Cloud End. This hotel is bounded by broad deodar jungle. It was constructed in 1838 by British ruler. Van Chetna Kendra and Himalayan Weavers is another spot where a tourist can enjoy. Visitors can plan their trip according to season or vacations, but booking of accommodation should be done in prior as lodging and boarding at this place without booking can be little trouble for visitors. Lots of online sites and travel companies are providing online booking so visitors can go through it. By Air: The closest airbase is Jolly Grant Airport which is situated in Dehradun. Frequent flights of Indian Airlines and Air Deccan are available to reach Mussoorie. Private taxi and buses are available from airport to Mussoorie. By Rail: The closest railway station is situated in Dehradun. The distance between Dehradun station and Mussoorie is just 34 km. The direct trains to Dehradun are available from almost all states of India. By Road: properly maintained roads allow visitors to travel Mussoorie with no difficulties. Public and private transport are available for tourist and these vehicles are accessible throughout the country.